A tribute to Portal, possibly the best game to be created in the past decade. 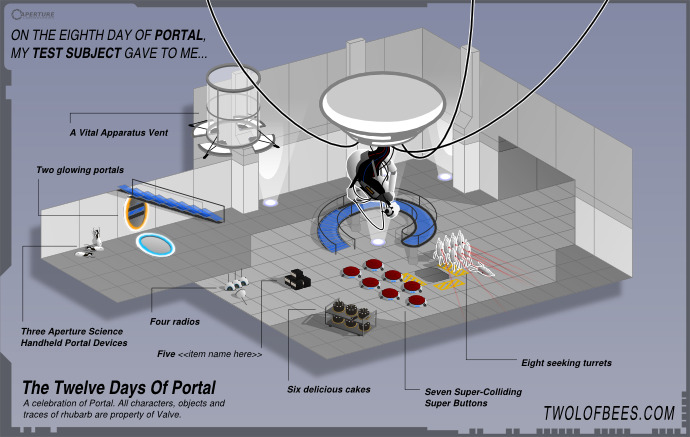 You can find more of our Portal fan art by checking out the Portal tag. On the eighth day of Portal, my Test Subject gave to me: Eight seeking turrets, seven Super-Colliding Super Buttons, six delicious cakes, five <<item name here>>! Four radios, three Aperture Science Handheld Portal Devices, two glowing portals, from a Vital Apparatus Vent.